Lewis Hamilton is hopeful he can score his first win with Mercedes in the Chinese Grand Prix after securing pole position for the Shanghai race on Saturday. The Briton, who has switched from McLaren to Mercedes for this year, beat Lotus driver Kimi Raikkonen to the top spot to secure his maiden pole with the German squad in just his third event with the team. 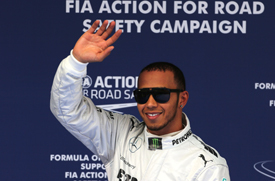 Hamilton admitted he was overjoyed at the result. “It’s an incredible feeling,” said Hamilton. “I am so happy to have my first pole for some time and I am just ecstatic. The lap was great, the team performed well all weekend so far and I hope we can carry this into tomorrow. “These tyres are very tricky this weekend, making the option tyre last is almost impossible, so it will probably be quite a short stint in the beginning. The former world champion, whose team dominated the Chinese race last year, said he did not expect to have such an advantage after finishing nearly three tenths of a second ahead of his closest rival. Lewis Hamilton takes Chinese GP pole, Shanghai 2013Hamilton believes his result shows he is on his way to proving critics of his Mercedes move wrong. “You cannot answer it in one result, but bit by bit, the more we impress and improve, they have to stand corrected,” he said. “The team is doing an incredible job. It could have gone either way, but I am grateful I am here, in the fight, and today is such a blessing to be here as it was a big step for me. This is a syndicated post, which originally appeared at F1 news – AUTOSPORT.com.